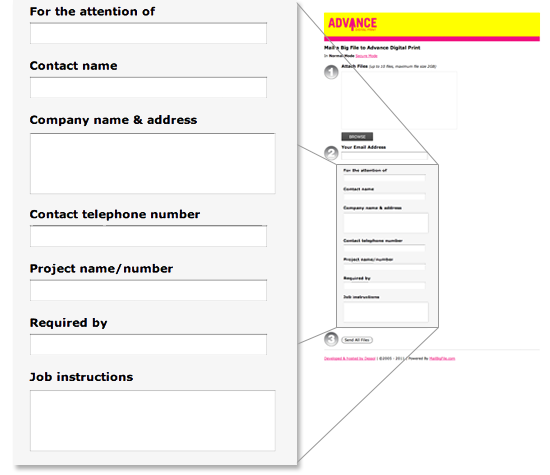 Case Studies – Custom Form Fields. Posted May 24th, 2011 by Karl & filed under Case Studies. A little while ago we introduced Custom Form Fields for our Business Account holders. This versatile feature allows you to keep track of all files sent to you so you know exactly what has been sent and by who. One particular exponent of this great feature is Advance Digital Print, who are one of our longest serving customers. Advance Digital Print – one of London’s oldest independent reprographic digital printers – have been providing digital print, copying, scanning and exhibition services for almost 50 years. Receiving a plethora of files every day (nearly 40,000 to date), Advance Digital Print need an efficient way of keeping on top of the files sent. This is where our Custom Form Fields come in. Our Custom Form Fields seamlessly integrate themselves into their work-flow, removing a lot of time and effort their end chasing up specific orders as the information is all contained in the one e-mail. What’s more, the Custom Form Fields are completely customisable. You don’t just have to have text boxes, you can have check boxes, drop down boxes, radio buttons and more; whatever you need to fit your needs. You can also have as many fields as you like. For more information on this great feature, or for a quote, you can either mail me directly by mailing sales@mailbigfile.com, or you can call me on +44 1502 588 885.